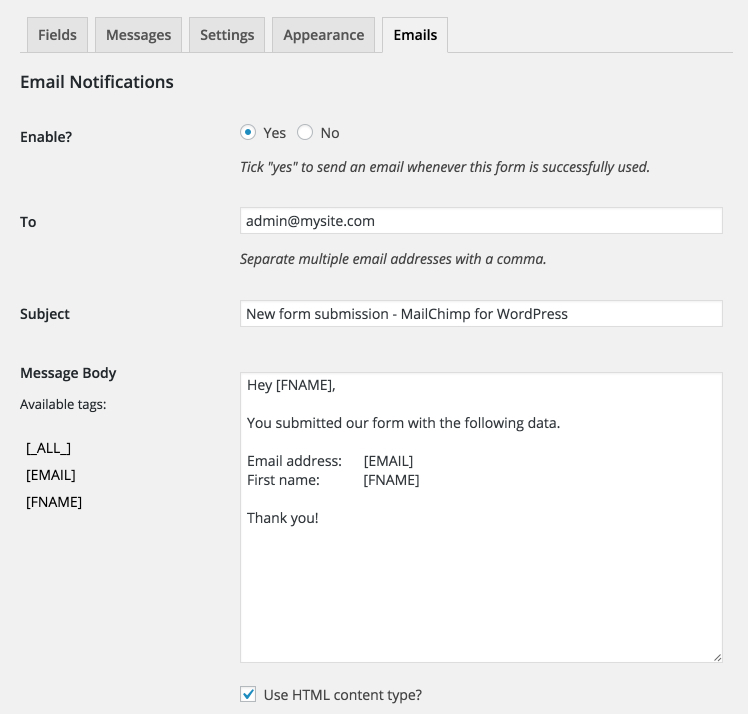 About an hour ago, we released updates for Mailchimp for WordPress itself and the Premium add-on plugin (formerly known as Mailchimp for WordPress Pro). We're happy to tell you that now version 3.0 is out the door, we were finally able to give some much needed attention to the "email notification" feature in the Premium plugin. After installing the updates (version 3.0.5), your edit form screen should show a new tab called "Emails". Opening this tab presents you with the following screen. This new settings page allows you to customize the entire email to your liking - where previously you could only enter an email address to send the notification to. As you edit your form, available email tags will automatically be updated so you can use them to show the value of that field in the contents of your email. This change also allows you to send an email to the person filling out the form: just use [EMAIL] in the "To" field. If you're not a Premium user, you can immediately unlock this feature (and several others) by purchasing a premium license. As always, we hope you like this change and please do not hesitate to let us know your thoughts in the comments.